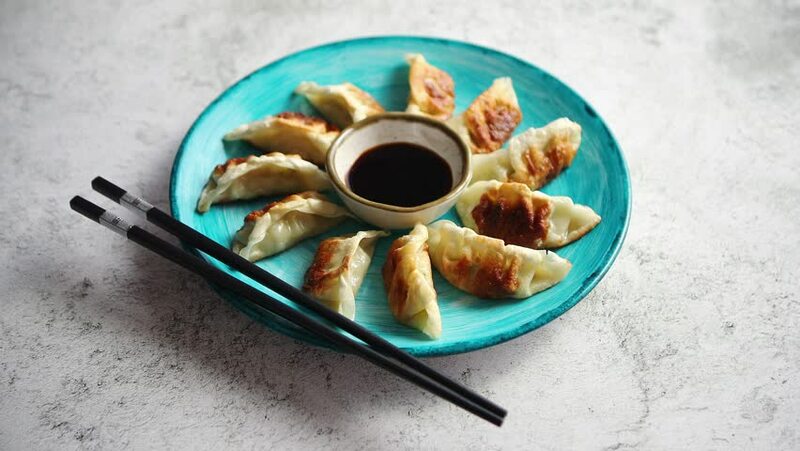 Traditional asian dumplings Gyozas on turqoise ceramic hand painted plate served with chopsticks and bowl of soy sauce over concrete texture background. Top view with copy space. 4k00:28Traditional asian dumplings Gyozas on turqoise ceramic hand painted plate served with chopsticks and bowl of soy sauce over concrete texture background. Top view with copy space. 4k00:29Delicious chinese dumplings served on wooden plate with chopstick and soy sauce in the middle. Placed on stone background with copy space. Chive od side. 4k00:23Slices of pizza on wooden plates. Party concept. hd00:18Taking Salmon Avocado Sushies. Japanese Sushi - Salmon avocado roll. Taking sliced sushies with chopstick. hd00:55Freshly baked choux pastry cake. Making homemade choux pastry cake Paris Brest with raspberries.